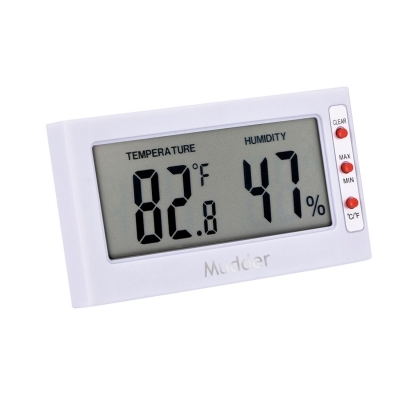 This Mudder monitor displays the temperature and humidity with large screen. It tests the indoor's air humidity or temperature is suitable or not. It can be put on any furniture with plain surface in your living room, bedroom, car or office. 1. Designed for indoor use only (except refrigerators), not suitable for outdoor testing. 2. Keep it away from water in case that it falls in water and cause damaging. 3. Press the button max/ min to get the max number, twice for the min number, press "clear" button, it will return to work and recalculate the max/ min value about subsequent time.